A total of 5 replacements arrived at the FOB, 3 British, 1 USMC and 1 US Army. The two US replacements were flown to the Patrol Base 55. Platoon A - Les Groupes de Combat Deux et Trois françaises voyageront à la région 61 (via les régions 66 et 63) à l'aube dans leurs véhicules LAV, avec une équipe GPMG (B), un tireur embusqué (A), un docteur, et un FOO. Ils dégageront les insurgés de la région. Vivé la France ! Platoon B - Right now, chaps, we've got our work cut out this week; we need to open up the MSR, and prevent Terry from blocking it again. Corporal Hutchins, take Section 1 and patrol through Rahthkabir. Intel suggests there are just a handful of taqiyah there, but take care - and an AT-4 (CS) with you. If things get too hot, call for artillery, and get out of there. And, take Sergeant Guy and Corporal Fox, they are starting to get cabin fever, you may need their help with the IEDs you will no doubt find. Corporals Lacey and Samuels - take your Sections (2 and 3), and clear out a nest of insurgents in Area 56; they're just a little too close to our FOB for comfort. You'll have the JTAC with you, and Corporal of Horse Horrocks' Scimitar - and, yes, I know the cavalry boys won't like being in the Green Zone, but you might need their Rarden and the 'crabs' if the INS decide to fight back. Standard ROE apply, of course. All clear ? Jolly good ! Platoons C and D - Listen up ! There's a large group of INS in Area 53. We're going in with both platoons and a FOO to clear them out. First off, we'll use UAV's to get a clear idea of the terrain during daylight. We'll try to get the jump on them by infiltrating Platoon D into the area from the east during the night - Lieutenant Townsend, ensure that your men are briefed on their routes and final positions. The Marines under Lieutenant Franklin will advance into the Green Zone from the north at dawn. With luck, the insurgents will be react to the Marines, and be unaware of Platoon D until it strikes them from the flank and rear. Ensure that all your men have NVG's, and that all movements are co-ordinated - we don't want any 'Blue on Blue' incidents. You'll have artillery on call, but there may be civilians in the area. Any questions ? The FOB will be guarded by Platoon A, Groupe de Combat Un; and Platoon A and B HQ teams. Patrol Base 55 will be guarded by the Humvee teams. 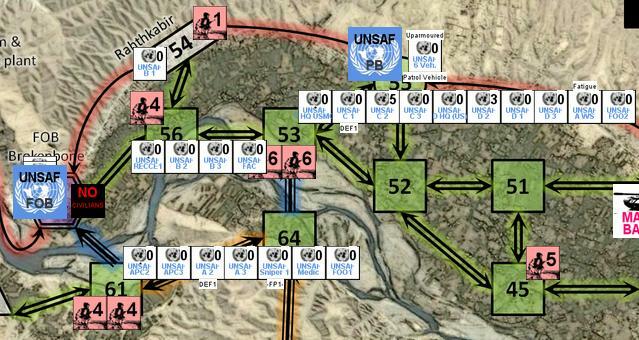 The two French groups remounted their VABs with the forlorn hope of catching the insurgents. This time they decided to drive directly to the area of interest via the bridge as fast as possible. At least one potential “dicker” on a motorbike was spotted. UNSAF Strength: 5 vs. 8 Insurgent Strength. The insurgents believe they can win and stand and fight. The British Army section infiltrated on foot into Rahthkabir. The insurgents, new to the ruins, were caught by surprise, a firefight ensued. The remained of the British platoon advanced down the hill moving around Russian-era minefields to meet up with a lone Scimitar on the road, they then proceeded into the Greenbelt. UNSAF Str of 4 vs. 4 Insurgent STR. – Firefight erupts. The combined pincer movement of the USMC and US Army closed on the large insurgent nest in the early hours of the morning. UNSAF Str 9 vs. 12 insurgent Str – Firefight erupts.